My style has been leaning towards fashion-forward bottoms and plain tops these days. I typically first get dressed by pulling out a particular item I want to wear (my floral pants in this example) and then work my way around that item. I find it easier to incrementally pull the pieces together rather than collectively trying to put together an outfit. I’m the type that’s always on-the-go so the last I want to do is spend much time figuring out what to wear, and I found that working around a bottom is much easier than working around a top. LOVE those dark floral jeans. The armparty is perfect too! this is a really cute casual look! really like the floral print! too cute! and you look pretty. Clean look. Love this type of dressing. So polished, I love subtle florals! Love your blog! So glad I found you! I'm following you now on GFC #593! Check out my blog if you'd like! Thanks:)! Great outfit, pants and handbag are awsome! WOW !! Loved this look 🙂 Wanna follow each other ? I just found your blog! I really like it, you're very stylish! 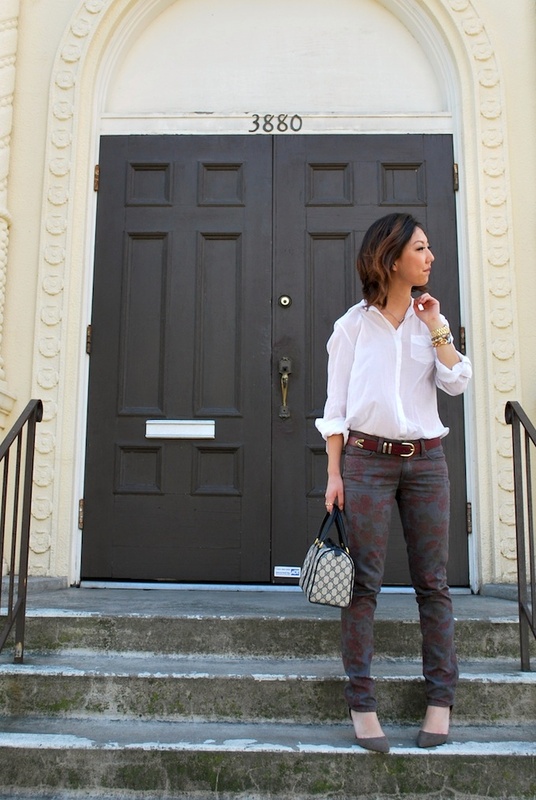 Love those printed pants! Very cute! Those pants are awesome! I love they're slightly faded – it makes them look extra great with a crisp white button-down. Fantastic look! Loving this so much !! THE PICS ARE SO GREAT , LOVE THE QUALITY! 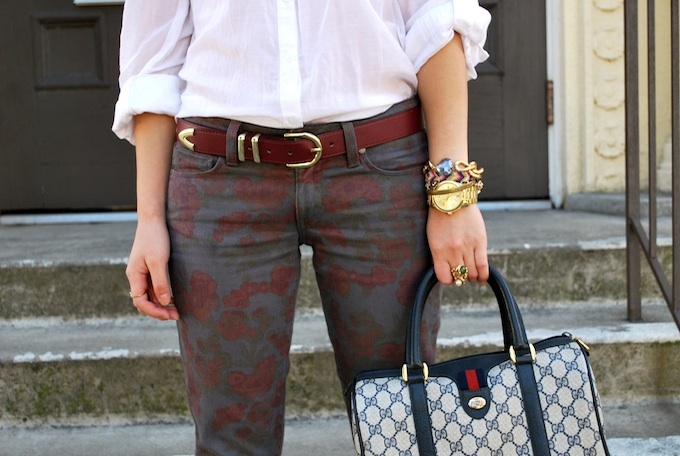 I really love the floral pants! I'm brand new to your blog, and loving what I'm seeing so far. Am adding it to my Google Reader feed. wow great outfit! nice shirt and BAG!!!!! que jeans tan bonitos! me encanta como las combinado con el bolso! nice outfit..wouldn't think those trousers would look good but you make them work! Wow! Awesome pants. I love your style. I love all your blog posts. I am following you now, #603 FOLLOWER!